Good. Former Library book. A sound copy with only light wear. Overall a solid copy at a great price! some highlighting All orders guaranteed and ship within 24 hours. Your purchase supports More Than Words, a nonprofit job training program for youth, empowering youth to take charge of their lives by taking charge of a business. Fine. 100% Money Back Guarantee. Brand New, Perfect Condition. We offer expedited shipping to all US locations. Over 3, 000, 000 happy customers. 120 p. Modern Plays . New. 100% Money Back Guarantee. Brand New, Perfect Condition. We offer expedited shipping to all US locations. Over 3, 000, 000 happy customers. 120 p. Modern Plays . Very Good. 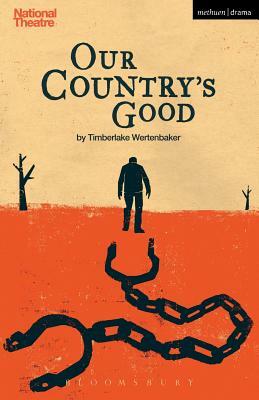 Our Country's Good (Modern Plays) by Wertenbaker, Timberlake, 2015-08-19. 120 p. Modern Plays .